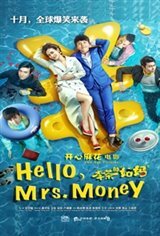 Adopted from the stage show of the same name, Hello, Mrs. Money tells the story of Li Cha, a poor guy, and his billionaire auntie. To win the heart of his beloved girl who likes money, Li Cha asks his billionaire aunt to help. Never met with his aunt before, Li Cha recognizes an male employee, Huang Canghai, as his aunt by mistake. For their own benefits, Li Cha, Huang Canghaiand Liang Jieruidecide to pretend Li Cha'saunt together, yet the 'real aunt' shows up, bringing audience tons of hilarious moments.